Leaders Sirens lost 1-2 to Zebbug Rangers in one of the three BOV First Division matches at the Centenary Stadium on Sunday. A defeat which brought to an end Sirens’ unbeaten run of twelve matches. An own goal on the half-hour put Zebbug ahead but John Nwoba equalised just before the end of the first half. However Igor de Rocha Souza notched the winner nine minutes in the second half. Sirens had three players sent off and Zebbug one. 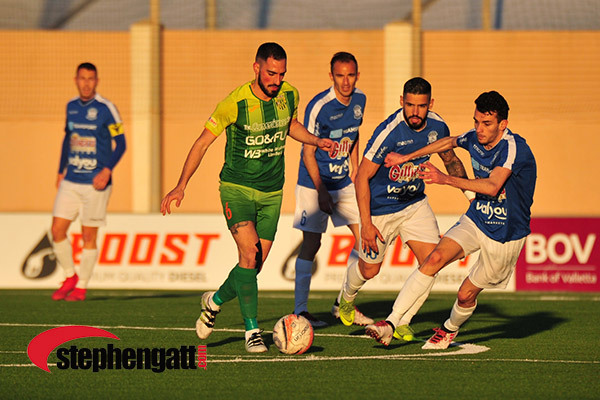 Naxxar Lions left it till late to beat San Gwann 2-0. Steve Meilak put them ahead on the 84th and deep into stoppage time, Mead Mifsud sealed the issue with a second goal. Johan Castano scored twice – on the 10th and the 14th – to hand Zejtun Corinthians a 2-0 win over Pembroke Athleta. Sirens lead the way on 46 points, followed by Gudja on 42, Santa Lucia 35, Naxxar 30, Pembroke and Swieqi 29, Mqabba 28, Lija and Zebbug 27, Vittoriosa and Zejtun 26, San Gwann 19, Qrendi 17 and Marsa 5.